Ghost soldiers : the forgotten epic story of World War II's most dramatic mission · One Book. One Author. One Hour. Notes from half title page: "Edwin Rose - the deaf Englishman. - Bataan - 3 years captivity. - Some men felt shame because they surrendered. - Sense of bitterness - Wash. turned back on them. - Ranger raid on Cabanatuan. - Dr. James Frisker; Vivian Hixen - [his] niece, helpful. - Bataan Memorial Museum in Santa Fe. - NPR radio doc. - Japan Society gave you fellowship to study Japan South. - General Homma's son - 3 days of meetings. - 2656 American perished at Cabanatuan. - No footnotes or [?]. - Dec. 14, 1944: Palawan Massacre. - Story of Eugene Nielsen. - Gen. MacArthur abandoned Phil. in March '42. - Lt. Col. Henry Mucci - CO 6th Ranger Battalion. - New Sec. - 120 men led by Capt. Robert Prince. - April 1942 - Bataan - Gen. soon to surrender. - Camp O'Donnell - Cabanatuan - nearly 9000 Americans would go through camp, 1/3 burried underneath." -- Notes from back endpapers: "Dr. Jimmy Fisher. - Edwin Rose - deaf Englishman. - Beast of Bataan - General Homma." -- Annotations by Brian Lamb in the margins and underlining of pertinent phrases throughout the book. - Example: p. 23: "After the war, it would be calculated that the death rate of all Allied POWs held in German and Italian camps was approximately 4 percent. In Japanese-run camps, the death rate was 27 percent." 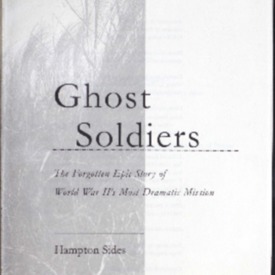 Sides, Hampton, “Ghost soldiers : the forgotten epic story of World War II's most dramatic mission,” One Book. One Author. One Hour., accessed April 21, 2019, http://booknotes.gmu.edu/items/show/517. A narration of the 1945 march to rescue 513 POWs, including the last survivors of the Bataan Death March, from a prison in the Philippines. "United States. Army. Ranger Battalion, 6th--History." "World War, 1939-1945--Regimental histories--United States." "World War, 1939-1945--Prisoners and prisons, Japanese." Gift of Brian Lamb, 2011. This work may be protected by copyright laws and is provided for educational and research purposes only. Any infringing use may be subject to disciplinary action and/or civil or criminal liability as provided by law. If you believe that you are the rights-holder and object to Mason’s use of this image, please contact speccoll@gmu.edu.